I know that in the past I have said that I was done with all things Kal Korff. I know that he attempts to stir hits to his website and his Facebook page by attacking anyone who expresses an opinion that differs from his. I know that no one in his world ever makes a simple mistake. It is always a LIE in capital letters and an attack on his expressed religious preference. But his latest claim, and his latest rant, deserve some coherent comment. He has been claiming that he has been involved in wargames somewhere along the Pakistani and Afghan border. He is leading, according to his latest set of lies, an international team to fight terrorism. And when he finished with his afternoon of mock combat, he sat down to Thanksgiving dinner with the troops... the inference being that these were American service members because we are the only ones to have celebrated Thanksgiving on the day Kal was making his rounds. None of this is true. It is a LIE. It is not a mistake, a distortion, or a misrepresentation. It is a LIE. He did not participate in wargames where he claimed he did. He did not feast with American soldiers as he claimed. I would be surprised if he had more than a turkey TV dinner heated in his microwave while staring at his computer wishing that he was a real colonel in a real organization. Oh, I expect Kal to tell me Pavel Janousek, with whom he dines regularly, will be filing suit in the very near future unless I retract the above statements. I would, of course, inform Mr. Janousek that the truth is an absolute defense in these matters, and I can prove that Kal did not participate in any wargames with real soldiers anywhere in the Middle East. Janousek, according to Kal, was going to file suit because of my blog postings in March 2007. In fact, in an email to me on March 9, 2007, which Kal claimed I deleted with out reading, Kal wrote, "You may send it [my response to Kal’s demand I remove the offending post] to me, since he [Jonousek] is leaving for Austria for one week (a luxury guys at his level can afford) and he said he expects this issue to be ‘resolved’ and that ‘Randle will step down’ by the time he is back, or he promised that he will be next in touch with you [meaning me] via his lawyers, and will proceed to bill you financially for every minute needed [bill away, but he has no legal authority to do that] to ‘deal’ with this. Not only lawyer time, but his time, and others." And then the part I really like, which is typical Kal... "He desires to be amicable [Kal knows that word?] and says if you have any questions, to contact him via me... But for now, he said NOT for me to give you his email address, so I won’t." Why am I surprised? Here we are three years later and not a peep out of Janousek, not a bill to be sent and not an email to me when I not only didn’t take down that post, but actually upped the ante later... but I digress. So Kal wrote this last week, " Heading back to Pakistan, towards the Afghan border. I will be out doing drills all day and a fast war exercise before taking off... Looking forward to this, I’ll be the commander of a small op for our training." He also wrote, "Our war game exercises included a FEMALE Indian sharpshooter who is a gold medalist in their country, she's a VERY nice lade. Another marksman who was a bronze medalist. It was interesting to see the different tactics Israel uses compared to India. In India and Pakistan they count their ammo, and measure each shot, as in shoot sparingly and try to get their targets with one shot. Since I am trained the Israeli way, this means to just open fire and advance while firing, so that the target is pinned down and cannot move nor dare show itself. As you advance you keep firing until you are on top of the target and it is then destroyed. The result was interesting...NO "casualties" on the Israeli side of things, the other side suffered mega hits. It was fun and educational. Often other personnel were taken out, leaving sharpshooters exposed and not exactly in the best position for them. It was quite a contrast." And then, "It is not practical, at least in my opinion, to do one shot, one kill in this situation. I prefer steady firepower, because it paralyzes the potential enemy. Then you advance while the target is trapped and trying to survive. By the time you are within point blank range it is too late for said target. I have seen many such engagements, especially with tracers used on the mix, the poor person on the other end does not stand a chance. It is always easy to revert to one shot, one hit, but it is more risky, since one is more exposed and it is hard to cover 180 degrees in front of you at times." And to prove what a hero he is, he wrote, "In my exercise, I was pinned down by three very different types of soldiers, so I had to take out all three. I went after the two and SAVED the sharp shooter for last. The sharpshooter should have been peppering me while I was laying mega rounds on them, but I kept suppressive firepower going across the 180 sweeping back and forth and just advanced like there was no tomorrow, using combination os Israeli tactics mixed in with some good ol American improvisation. :-)"
There is so much wrong here that I don’t know where to begin. He knows nothing of fire discipline. Spraying the area might look good in the movies but wastes ammunition and if you’ve had to hump it in with all your other gear, you might not be inclined to burn through it so fast. It might be difficult to get more, unless you happen to be using paintballs... but we’ll get to that in a moment. 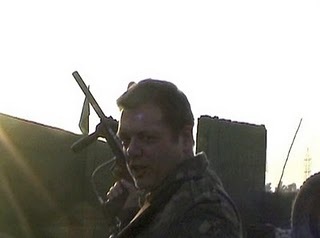 He understands nothing about snipers, who would be five hundred to a thousand meters from his, or her, targets... and anyone who was exposed for two seconds would be targeted. A fifty caliber round can take out an enemy hiding behind a wall, as has been done more than once in Iraq and Afghanistan. Jumping up and running forward, spraying the area like you’re using a fire hose is a good way to get killed. He does not understand fire and maneuver, though he does understand that in paintball war, you can jump up and run forward spraying the area. I doubt the Israelis train with paintball guns, or learn to run and gun. Why am I so sure that Kal was playing paintball in Prague and not commanding wargames in Pakistan? Well, to show himself the hero, he posted pictures which prove my point. As you’ll see, Kal is holding a paintball gun, not a real infantry weapon, not anything in the NATO arsenal, and nothing used in combat training. And below, Kal’s buddies are wearing chest protectors used in field hockey and in paintball exercises. 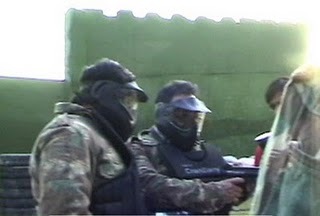 You’ll also note that they are wearing helmets and face protectors just like those seen on other paintball ranges, but not something you’d see in a combat arena. No one trains with paintballs, and if you think about it, you’ll know why. For th ose who would to see much more about all this, visit http:Kalisanidiot.blogspot.com. There you’ll find more evidence that Kal played his wargames in Prague and additional information about his activities. The real reason I wanted to go through this has nothing to do with Kal’s claims that he is some sort of soldier, that he is a colonel in some mythical organization, but because he had the audacity to label Jesse Marcel, Sr., a liar. This from a man who can’t even keep it straight that he is married with a genius son or so he has said. Kal, in another rant, said, "... I also was the first to publish Maj Jesse Marcel's military file which PROVES he was a LIAR — and yes, about Roswell. Since Marcel lied, the very nature of this dynamic ELIMINATES Roswell as being ‘ET.’"
"FACT: Marcel said he was a pilot. He said he flew the wreckage to Texas. Marcel was NEVER a pilot." Truth: Marcel said he had flown as a pilot, not that he was one which is not quite the same thing. I can say that I flew as a helicopter doorgunner while in Vietnam because I did, but I was never rated as a doorgunner. We sometimes did things like that to learn about other aspects of our mission. Marcel didn’t say that he flew the UFO wreckage to Texas. That came from Walter Haut, the public information officer, who regretted the line saying Marcel flew the stuff to Fort Worth. What he meant was that Marcel had escorted the wreckage to Fort Worth. So Marcel is in the clear on that. Given the nature of the interview in which this surfaced, I’m not sure that Marcel said he had five air medals. That might have been an assumption by Bob Pratt who recorded the interview and then transcribed it. The transcription is sometimes confusing and I asked Pratt if he still had the tape so that we might clarify these issues, but he had long since reused it. We have found citations for the two air medals and I even went to the unit history in an attempt to discover additional citations but failed. I will note that my own military records were only recently updated to reflect the number of air medals that I had been awarded. Other decorations are not on my "official" record, though I do have the citations. So this is really a "So what?" Kal, in his rant continuned, "He said he crashed off the coast neat [sic] Australia and was the only survivor. He was NEVER in any ‘plane’ crash and no one was killed." I’m not sure what Kal means here but Marcel did say that he was in an aircraft shot down off Port Moresby, which, I suppose you could say was the coast of Australia, but he never said he was the only survivor. This comes about because of a comma. Pratt, in his interview, wrote of Marcel’s answers, "I got shot down one time, my third mission, out of Port Moresby [Pratt inserted in parens] (everybody survive) [and Marcel answered] all but one crashed into a mountain." This then is confusing. By adding a comma, I change the meaning. Pratt asks, "Everyone survive?" And Marcel said, "All, but one crashed into a mountain." This suggests that everyone survived except one unfortunate airman who died when he hit a mountain. Or Marcel said, "All but one crashed into a mountain." This means that everyone, with one exception, died when they hit the mountain. Either way, Marcel made no claim of being the sole survivor and Kal is flat wrong on this. Kal then wrote, "He said he had a Bachelor's Degree in Physics from George Washington University. I was the ONLY UFO researcher to bother checking this." This is not true. I actually checked (as did Robert Todd) with each of the universities that Marcel said he had attended, going so far as to inquire if there were any special programs in the 1940s, during the war, that would allow a soldier to attend some classes off campus and earn college credits. GWU told me that they did have some programs like that, but, unfortunately for us, Marcel’s name turns up on no rosters. Kal said, "Marcel NEVER went to GWU." And here, Kal has a point. The part of the paragraph in which Marcel made this claim is rather jumbled and unclear, but it does seem to indicate that Marcel told Pratt this. When I talked to Pratt, he had no memory of this specific. And this is apparently the only place that Marcel made such a claim, but it is untrue.Kal claimed that "Marcel said he retired from the AF because they had kept him so busy especially after he wrote the very report that Harry Truman read on TV re the Soviets exploding their first A Bomb." Marcel said that he had been in the service for eight and a half years as well as the National Guard and felt he had a duty to his family, which is not what Kal said here. He didn’t say that Truman read his report on TV, but read it on the air, which is not the same thing. Yes, it’s splitting a fine hair, but one that Kal would be quick to split if the situation was different.Kal continues his rant, writing, "Truman NEVER READ ANY SUCH REPORT on TV. Marcel was also NOT the author. The fact is, Project Mogul was as classified as the ABomb project during WW II. It was one of our top secrets." We know that Truman didn’t read a report on TV, but on the radio, so Kal is wrong. We also know that Project Mogul came into existence after World War II so Kal is wrong here. The Mogul project in New Mexico was not classified as one of our top secrets. In fact, pictures of Mogul arrays appear in newspapers on July 10, 1947; Dr. Albert Crary, the leader of the project used the term "Mogul" in his personal, unclassified diary; and it was only the purpose, that is to spy on the Soviets, that was classified. The skeptics have been getting this wrong for years.Kal said, "Marcel did NOT have a ‘need to know’ and the term ‘flying disc’ did NOT mean ‘ET’ back then, but likely Russian." Actually they were also called flying saucers, which Kal for some reason can’t comprehend, and one of the theories was that they were interplanetary (as opposed to interstellar), most likely from Mars... or that they might be Soviet.Kal tells us, via Facebook, "If you can disprove it, I will admit I was wrong, no problem. I'll also refund your money [if you bought his book]. Please let me know what you think of my book, I will revise it later, but fighting against Islamofascism is more important to me..."
Well, I proved that a number of Kal’s claims were wrong and I’ll wait for his clarification, but I doubt I’ll ever get it. I also await the promised lawsuits that have never arrived. I agreed to three debates... Kal agreed to one and then bailed at the last minute. I await the KPMG audit of my work that was supposed to be published three years ago... but no such audit was ever undertaken. I await proof of his 500 (yes five hundred) book deal... or that he will publish any book in the near future. I await his apology for claiming that there were no black sergeants at Roswell in 1947 when there were, at least, 24. I await his apology for suggesting that Mack Brazel’s picture never appeared on the front page of any newspaper in July 1947. And I wait his apology for calling me a coward and worse at almost the same time claiming he respects all those who served their nation in a combat role. I could go on, but I believe the point is made. What set this off was that a guy, Kal, lying about his "wargames" on the Pakistani border would call a man who served in uniform, who was decorated in World War II, who was a real colonel, albeit, a lieutenant colonel, a liar. Who really is the bigger liar here... the man masquerading as a colonel in a pretend organization or the man who might have embellished his educational background, something Kal also does... how goes that Ph.D. Kal? I got an email from a fellow the other day talking about the Del Rio UFO crash. He said that he had gone through the local newspapers, had interviewed various long time residents, and completed other research without finding out anything about the crash. That got me to thinking. True, you could say that the government had effectively covered up the whole story. But then I thought about the big five in UFO crash reports and realized that they had never effectively covered up the stories. Roswell, as you may remember, was reported in the newspapers all around the world as a flying saucer crash for about three hours. Then the cover story of the weather balloon kicked in and everyone forgot about it. Jesse Marcel, Sr., then told Stan Friedman and Len Stringfield about it and the race was on. Newspaper clippings were found. Government documents were found and here I’m thinking of the FBI Telex as a good example and not the laughable MJ-12 papers. And, there were many witnesses who were there in Roswell who did remember something about it. The Las Vegas crash of 1962 was reported in newspapers, especially those in the west. There were illustrations of the object that flashed through the sky and there are many official documents in the Project Blue Book files about the event including the report from a general officer. I talked with a couple of dozen witnesses who saw the thing in the sky, who reported it interacting with the environment, and police officials who went in search of the wreckage. The Kecksburg crash of 1965 was reported in the newspapers and I have lots of clippings from them. There are many official documents in the Project Blue Book files and Stand Gordon has talked to dozens of witnesses. There are reports of something being taken out of the woods on a flatbed truck. The Shag Harbour crash of 1967 was reported in the newspapers. The Condon Committee, the Air Force sponsored study of UFOs even mentions the case. Chris Styles and Don Ledger have uncovered dozens of official documents, there is a picture of the object (well, light) in the sky and they have talked to dozens of witnesses including police officials, military officers and many civilians. The Washington state crash of 1979 was reported in the newspapers. There are few official documents but Jim Clarkson has talked with dozens of witnesses who were in the area. There are some police reports and Clarkson has learned of a possible military connection, meaning they cordoned off the crash site. And, no, here it really matters little whether these crashes are the result of a natural, though extraterrestrial cause, or if the object that fell had been manufactured on another world. The point is that any researcher can find lots of documentation even if that documentation suggests a natural event rather than an alien craft. With Del Rio there was nothing in the local newspapers and the first mention I have been able to find is 1968 in Pennsylvania. There are no independent witnesses in the area who can verify something strange. There are no military witnesses either. The conclusion to draw here is simple. Even if the event was eventually classified there is some kind of open source to lead us to it. We can find newspapers and government documents. We can find independent witnesses who share part of the story with us... witnesses who have a demonstrated connection with the area and the time. But with Del Rio, and some of the other crash reports, there is nothing like that. It is just one more reason to suspect that nothing happened in those cases. There are those who had suggested that my opinions on Robert B. Willingham and William A. Rhodes are inconsistent. They wonder why I have suggested that there might still be something to the Rhodes photographs after he was caught without a degree and why I have written off Willingham completely. Why do I believe there might be something to Rhodes and not Willingham’s tale? The answer is simple. Rhodes’ belief that he had the equivalent to a Ph.D., or that he had received an honorary degree from Columbia University, does not impact his being in Arizona, in his backyard, when the UFO flew over. In other words, we have him in a place where we could expect him to be and the Ph.D. doesn’t alter that. You can argue, and I would agree, that this episode with the college degree, and the differing versions of how it came to be, suggest that he could spin a tale or two when the mood moved him. It impacts his credibility and if we were in court, such a discrepancy could be used to impeach his testimony. If he would lie about that, what else would he lie about? But that doesn’t change the fact that he could have been in his backyard when the mysterious object allegedly flew over. Yes, I said allegedly because we could argue that nothing flew over and that the photographs are faked but that doesn’t flow directly from the nonexistent degree. With Willingham and the Del Rio UFO crash, his story of being an Air Force officer and fighter pilot directly affects his story. If he was not an Air Force officer, then he wasn’t a fighter pilot and he wouldn’t have been in a position to see what he claimed. He could not have been in the cockpit of an Air Force fighter unless he was an Air Force officer. The high rank he claims, which suggests credibility, works against him if he never achieved that rank. In other words, his lie about being an Air Force colonel directly impacts the validity of his story. He couldn’t have been in a position to see the UFO crash if he was not in the cockpit of the fighter and he couldn’t be in the cockpit unless he was an Air Force officer. So, Rhodes claim of a Ph.D. is not a disqualification for his story. It impacts his credibility and requires us to take a deeper look at the photographs and what they show. To some, this embellishment is enough to reject Rhodes out of hand. For others, it "beclouds" the issue but doesn’t mean that the photographs are faked. With Willingham, his claim of high military rank does disqualify his story. If he was not an Air Force officer he wouldn’t have been in the fighter and he wouldn’t have seen the craft. This should be enough for everyone to reject the story, especially since there are no other witnesses, no photographs and no physical evidence. This does mean the story is faked.